For both casual gamers and occasional digital warriors, a monitor can make all the difference between victory and defeat. 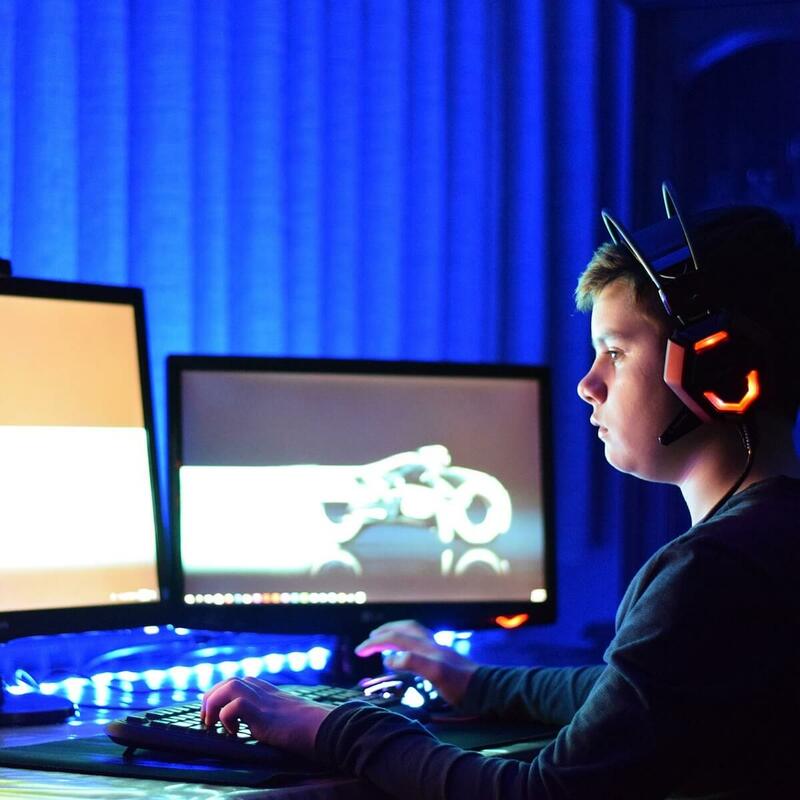 To get the most out of the latest games, besides a gaming PC with a powerful CPU and GPU, you also need a monitor that is able to display the action without any blurred images, tearing, and other motion issues. The best display will provide you an edge over your opponents while delivering the smoothest and the most immersive gaming experience you have ever lived. Screen size, aspect ratio, resolution, refresh rate, response time, panel type, viewing angle, G-Sync, and FreeSync are the essential factors worth considering while you’re shopping for monitors. The Predator X34 is designed to provide the ultimate gaming performance and style, and it will inevitably transform your viewing experience by immersing you deep into the action. It features the NVIDIA G-SYNC technology that eliminates screen tearing to offer you an epic gaming experience. The 34-inch display shows all the details and provides a uniform viewing experience lacking blind spots. The monitor offers a wide field of view which bring a better gaming experience compared to a flat display. It’s able to minimize display stutter and input lag so the scenes will appear instantly. The objects look sharp, and the gameplay is smooth without motion blur. You can pump up the sound with the two built-in speakers. It provides various ambient lighting effects that can be adjusted according to your preferences. The Blue-Light Filtering technology makes sure to protect your eyes. 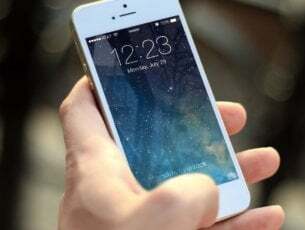 You can use it to charge your smartphone or any other portable device quickly. Other essential features include the following: an aspect ratio of 21:9, a resolution of 3,440 x 1,440, a response time of 4ms, a viewing angle of 178/178, a contrast ratio of 100 million:1. This 35-inch widescreen allows you to view in-depth details with more spacing in vivid and crisp visuals. The AG352UCG is not great for gaming only; it’s also amazing for watching movies, editing photos and videos as well. The monitor features a curved panel with vibrant colors for an exciting and immersive gaming experience. It’s configured in such a way to help reduce eye fatigue. It comes with the NVIDIA G-SYNC technology that synchronizes the display’s refresh rates to the graphics card. It eliminated screen tearing, and it minimizes display stutter and input lag. The monitor provides the smoothest and the fastest visual gaming experience. You’ll get a fluid and responsive gameplay. The objects look sharp, the scenes appear instantly, and the color quality is vibrant. The monitor provides the best visibility in dark areas of the screen. You have three levels to adjust the dark portions of the screen. Game Fire is a game booster that will get rid of low FPS, lags, freezes and other issues while playing. 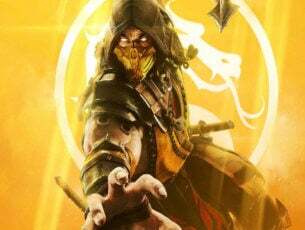 Download it now (free) for a better gaming experience. 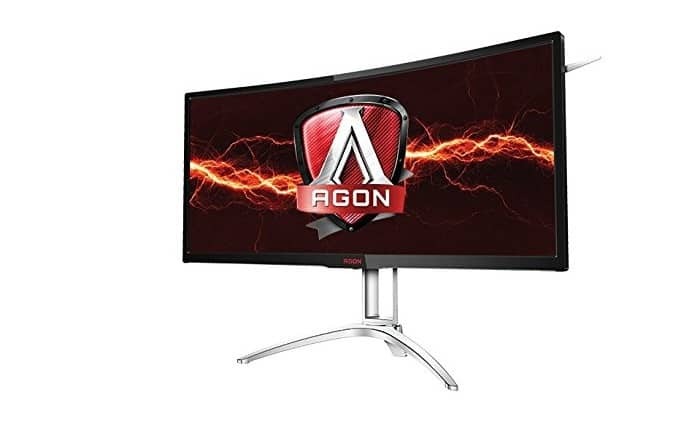 The AOC Agon AG352UCG features an aspect ratio of 21:9, a resolution of 3,440 x 1, 440, a response time of 4ms, a viewing angle of 172/178, and a contrast ratio of 2,000:1. If you’re running games using AMD or Intel-based graphics and you need an ultra-wide monitor that doesn’t cost a fortune, then this is the right option for you. It comes with the FreeSync technology that offers a seamless gaming experience. The monitor provides fluid movement for fast-paced games. LG 34UC79G-B eliminates tearing and stuttering. It provides enough precision and accuracy to play the latest games. It reduces blurring and ghosting to make the action smoother and your reactions more precise. It optimizes the gaming experience from any viewing angle. The Crosshair places the striking point in the center of the display, enhancing firing accuracy in FPS games. The Black Stabilizer reveals excellent details in dark scenes. The Dynamic Action Sync feature provides smooth gaming. 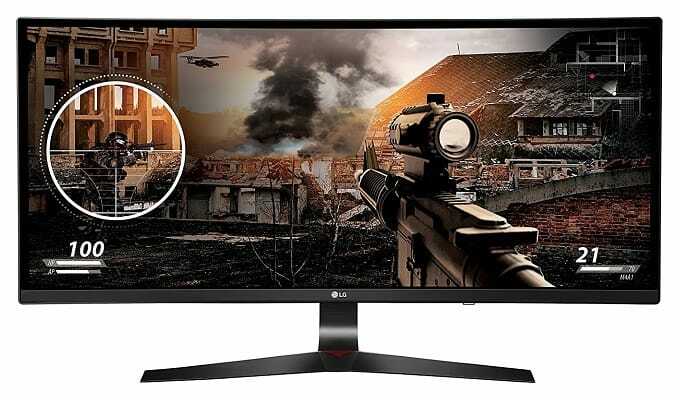 The LG 34UC79G-B also comes with an aspect ratio of 21:9, a resolution of 2,560 x 1,080, a response time of 10,3 ms, a viewing angle of 178/178, and a contrast ratio of 1,000:1. 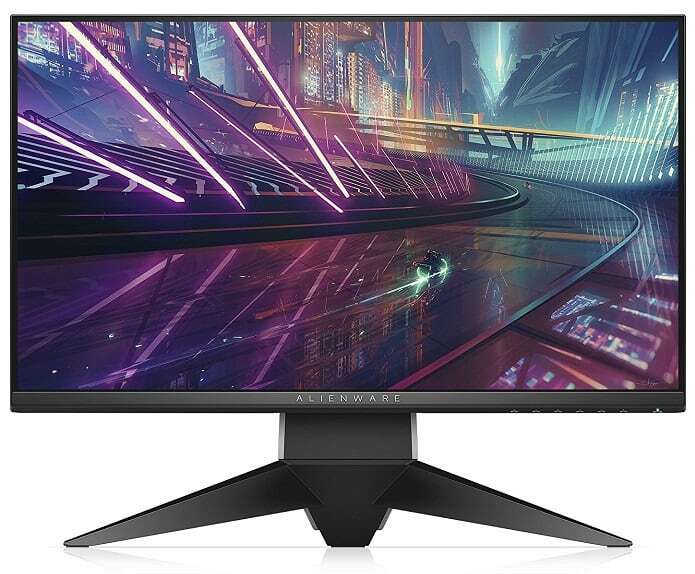 The Alienware monitor features the iconic design you might already be familiar with for the most exhilarating and immersive gaming experience. Whether you are just starting in the gaming area or you’re the most advanced enthusiast, Alienware’s features are some of the best for enhancing your gaming experience. It provides rapid-fire and tear-free graphics that don’t require user adjustments. The monitor offers a responsive gameplay with sharp images thanks to NVIDIA G-Synch tech. This 25-inched display is built with premium materials with silver and black chrome finish. It features an adjustable height for your ideal position. It comes with a fully customizable RBG lighting system for offering vibrant lighting effects. It comes with an easy-to-use dashboard. The Alienware offers customizable preset game modes and guiding lines for multi-screen setup. More essential features sported by the monitor include the following: an aspect ratio of 16:9, a resolution of 1,920 x 1,080, a response time of 1ms, a viewing angle of 170/160, and a contrast ratio of 1000:1. 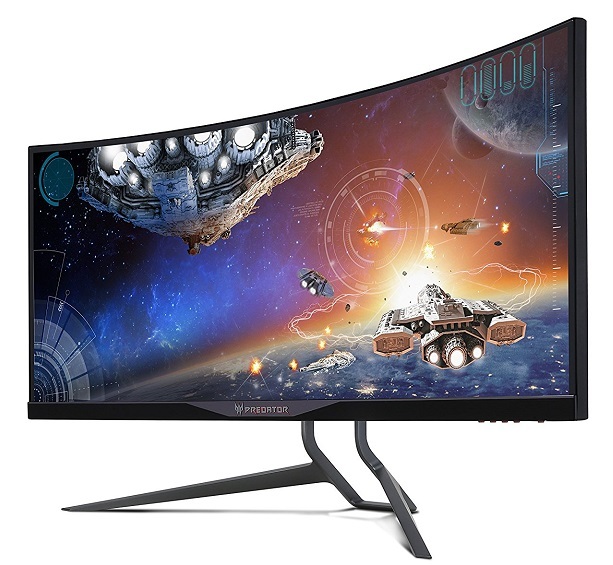 This is a large 32-inch screen for your desk that was created with business professionals in mind, but this doesn’t mean that it doesn’t have to offer a load of cool features for gamers. The monitor is focused on offering phenomenal viewing angles. It comes with a Darkroom Mode that adjusts the brightness and the contrast of images. It provides high clarity and sharpness to all details. The BenQ PD3200U creates the optimal setting for gaming in darker environments. It comes with the revolutionary CAD/CAM Mode that provides superior contrast. The Animation Mode lightens image areas to visualize darker areas better. The monitor comes already calibrated and prepared for offering the best viewing experience. 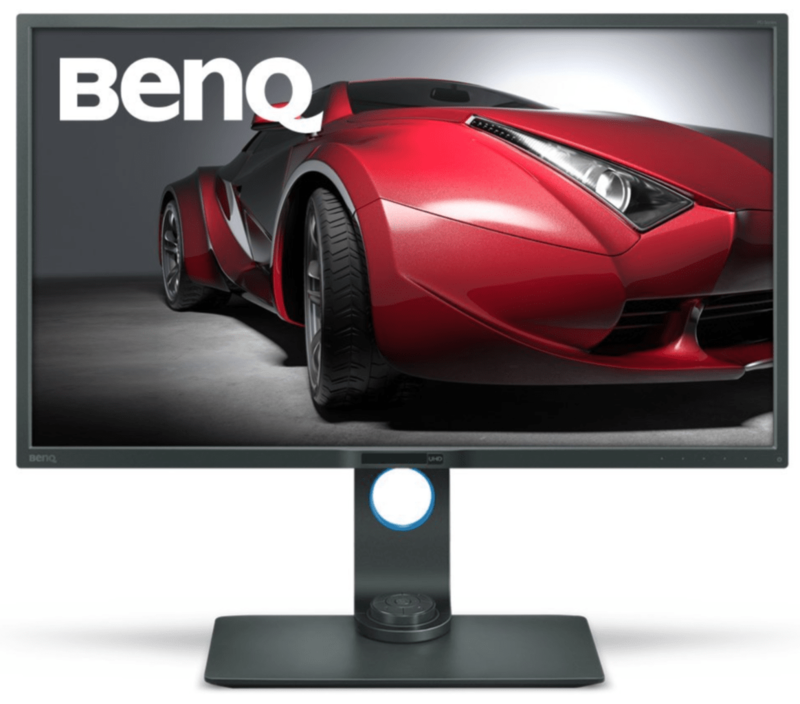 The BenQ PD3200U also features the following essential specs: aspect ratio of 16:9, resolution of 3,840 x 2,160, a response time of 4ms, a viewing angle of 178/178, and a contrast ratio of 1,000:1. 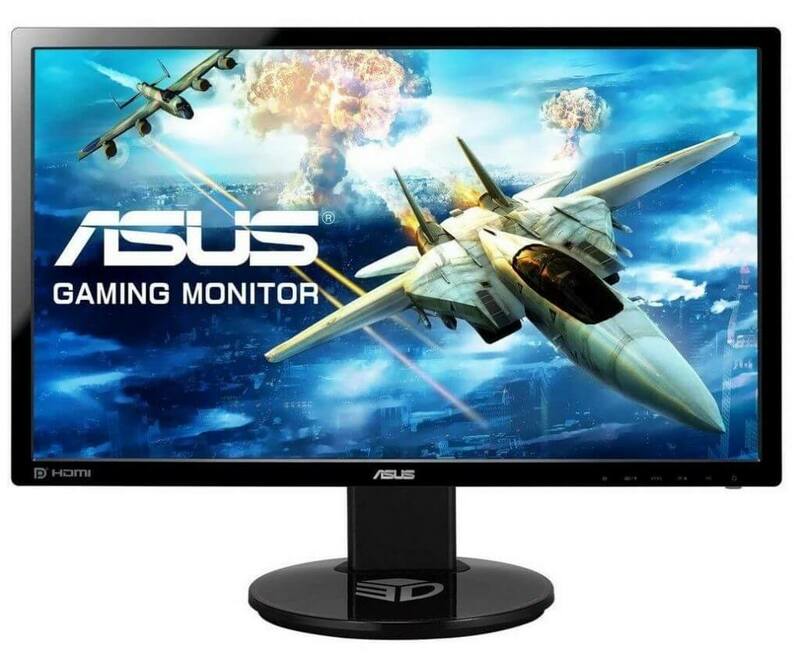 This 24-inch gaming monitor offers excellent graphics features and has a really friendly price tag. Once you’ve seen what it can deliver, you’ll ask yourself why this monitor stayed under your radar for so long. 144Hz rapid refresh rate and 1ms response time. Thanks to these features, this monitor renders fast action games impeccably. 16.7M. color temperature selection for crystal-clear images and colors. Excellent viewing experience thanks to multiple adjustment options, including wall-mounting support, ergonomic tilt and height adjustment. Built-in 2W stereo speakers capable of delivering distortion-free sounds. Of course, if you want an excellent audio experience, you can pair the monitor with one of these PC speakers. Several ports for multi device connections. If you really like this monitor, you can check it out on Amazon. Take your favorite games to the next level with either one of these powerful monitors to match the power of your PC. They’re all able to deliver a smooth and immersive gaming experience without blur, flicker and other issues that might stand between you and victory. 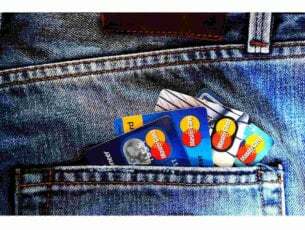 Analyze their features and get the one that seems perfect for your needs.